The next step is to connect up the wires from the LED’s. Since the small magnet wire is very fragile it needs some sort of support to prevent the wire from breaking. Rather than solder bigger wire leads directly to the magnet wire I used a small piece of printed circuit board material to support the connection. I used five minute Epoxy to secure the PCB to top inside of the boiler. The wiring connections are shown in next two pictures. 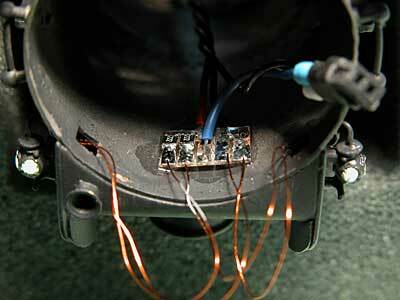 In my installation the LED’s are going to be driven from a DCC decoder output with a 12 volt supply potential. A 2.2k series resistor was added in series with each LED to limit the current. The markers are a bit bright with this value and I'll probably use a 3.3k resistor for the next installation. 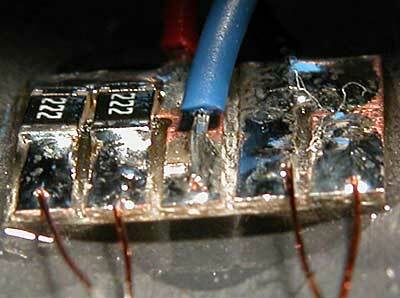 In this next photo you can see a close up of the circuit board along with the two surface mount resistors. You can just as easily use regular leaded resistors; I just used the surface mount ones as the PC board made for convenient mounting. If you're modeling white marker lights then you are done. If you want to model red or green markers use a permanent ink pen such as a “Sharpie” and simply color over the clear lenses. That’s pretty much all there is to the lighted markers, I hope this write up encourages you to give them a try. They really do look nice, especially when driven by a Tsunami decoder with the lights slowly increasing in intensity as the steam generator spools up. 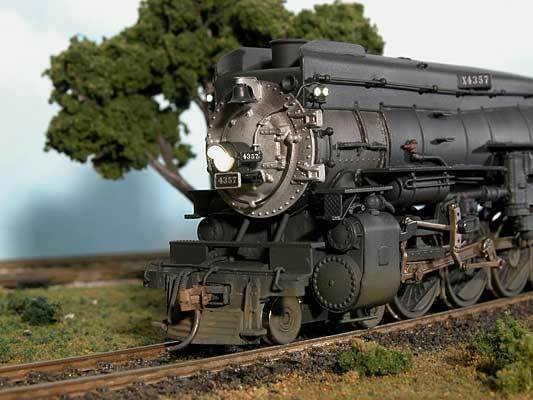 Here’s a final picture showing the completed locomotive with its headlight and markers on.